Mid-County’s Fire Prevention Division provides public education for our entire district. Public safety is the fire prevention division’s main concern. We encourage everyone to be prepare for the event of a fire or other emergencies. Feel free to contact our Fire Prevention Division for more fire safety information or to schedule a fire safety presentation. It’s important to have enough smoke alarms in your home. Fire research has shown that with today’s modern furnishings, fires can spread much more rapidly than in the past when more natural materials were used. Smoke alarms should be installed inside every sleep room, outside each sleeping area, and at least one on every level. On levels without bedrooms, install alarms in the living room (or den or family room) or near the stairway to the upper level. Smoke alarms should not be installed in kitchen to minimize false alarms when cooking. You should mount smoke alarms high on walls or ceilings. Wall-mounted alarms should be installed not more than 12 inches away from the ceiling. You should also make sure to follow all the manufacturers instructions when installing a smoke alarm. Smoke alarms are only good for ten years from the date of manufacture. If you are in need of smoke alarms for your home, please fill out our Smoke Alarm Request form. Does your family know what to do if there is a fire in your home? Make sure you plan ahead. If a fire breaks out in your home, you may only have a couple minutes to get out safely once your smoke alarm sounds. Everyone in your home needs to know what to do and where to go in case of a home fire. Having two ways out of every room and a family meeting place are tow of the most important parts of a home fire escape plan. Find out more about home fire escape plans at https://www.nfpa.org/escapeplan. Brush Fire is considered a season in Mid-County Fire Protection District and depending on the weather conditions that season can arrive at any time of the year. 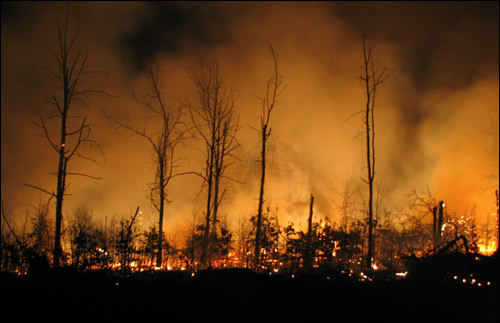 Active brush fires demand enormous amounts of manpower, equipment and time. Brush Fires can continue for days endangering property, wildlife, and the many resources used to fight them. The lake area terrain brings added challenges in managing fighting brush fires ranging in size up to over 900 acres. Outside sources including Conservation, AmeriCorps and Statewide Mutual Aid are continuously used and welcomed by the inadequate quantity of staffing available here in our own District to fight these types of fires. 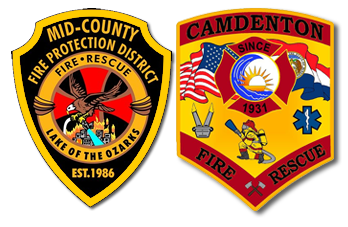 Please call our office at 573-346-3262 to find out if it is a burn day. A permit is required to burn within our district.